NIACL AO Mains Exam is on its way and a lot of aspirants are heading towards new hopes with this upcoming opportunity. Thus, the English Language can be an impetus for their success by helping them save crucial time and score good points in lesser time and effort. So, instead of boiling the ocean, try building up a strong vocabulary, an effective knowledge of grammar, and efficient comprehension skills so as to be on the ball to face this particular section. 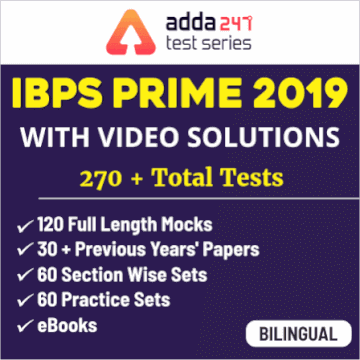 Here is a quiz on English Language being provided by Adda247 to let you practice the best of latest pattern English Questions for upcoming NIACL AO Mains Exam 2018-19. Directions (1-5): Read the following passage and answer the following questions given below. Some words are given in bold to help you answer some of the questions given below. Secularism is the concept of independence of the state and the religious groups. This is an ideology which is highly important for a democratic country and especially the one where people from various religions reside. Secularism ensures the freedom of expression of ideas and beliefs of one and all. It also helps in the peaceful functioning of the state. India is a country comprising of various religions such as Hinduism, Islam, Buddhism, Sikhism, etc. Secularism is one of the most important achievements of independent India as it has ensured equal treatment of people in all aspects regardless of their caste, religion, beliefs, etc. After the colonial struggle and their concept of Divide and Rule, our foundations and unity among different religious groups were shattered. (A) This called for the establishment of a secular state where government does not formulate policies and makes decisions favoring or loathed a particular religious group or caste. The inculcation of secularism in the constitution brings along many other fundamental rights of the citizens of the country such as the right to expression and religious freedom. India being home to people of a large number of religions, it is more prone to religious conflicts and other political and social damage. Secularism here ensures the proper and fair functioning of the government meanwhile providing all the religious groups with the rights to practice the religion of their choice and express their opinions and beliefs freely without fear or hesitation. There have been certain instances in history where the majority groups have tried to establish their dominance over various minority groups and sometimes also on the government. The implementation of secularism has kept this issue in check by working independently from the religious groups and giving out equal freedom to all the religions and castes. Secularism also has some threats and barriers but it is the responsibility of the secular state to work tirelessly with the goal of achieving peace and understanding among all the religions prevailing and allow the harmonious working of the governmental organizations meanwhile providing fundamental rights to all the citizens irrespective of their caste, religion, beliefs etc. Hence, it can be concluded that for a diverse country like India, introduction of secularism is indeed a blessing as people can express their opinions freely and can openly profess or practice the religion of their choice or choose not to practice any at all. Q1. In the passage given, a sentence (A) is given in BOLD. There may or may not be an error in one part of the sentence. Choose the part which has an error in it as your answer. If there in no error then choose option (E) as your answer. The error is in option ‘d’. It should be ‘loathing’ instead of ‘loathed’. Since the sentence is in simple present tense, it will be loathing and not loathed. Q2. Which is SIMILAR in meaning to the word INCULCATION given in BOLD? ‘Promotion’ is similar in meaning to ‘inculcation’. Inculcation means the act of inculcating, or teaching or influencing persistently and repeatedly so as to implant or instill an idea, theory, attitude, etc. Q3. Which of the following is/are TRUE in context of the passage? Secularism ensures the freedom of expression of ideas and beliefs of one and all. There have been certain instances in history where the majority groups have tried to establish their dominance over various minority groups and sometimes also on the government. After the colonial struggle and their concept of Divide and Rule, our foundations and unity among different religious groups were shattered. India being home to people of a large number of religions, it is more prone to religious conflicts and other political and social damage. All are correct in context of the passage. Q4. How according to the author, Secularism is a blessing for India? All (a), (b) and (c) support the fact that secularism is a blessing for India. Refer paragraph 4 of the passage. Q5. Which is OPPOSITE in meaning to the word PREVAILING given in BOLD? ‘unfixed’ is opposite in meaning to ‘prevailing’. Prevailing means existing. Directions (6-10): Read each of the following sentences to find out if there is any grammatical error in it. The error, if any, will be in one part of the sentence. The number of this part is your answer. If no such error is there, mark (e) as your answer. Error is in part B. It should be ‘functioning’ instead of ‘function’. Error is in part D. It should be ‘since’ instead of ‘for’ as no specific time frame has been given. Error is in part C. It should be ‘resulted’ instead of ‘resulting’ as the sentence in in past tense. Error is in part A. It should be ‘of’ in place of ‘off’. Directions (11-15): Each question below has two blanks. There are five pairs of words below the sentence. Each pair is lettered. Choose the pair of words which can be filled up in the blanks in the sentence in the same order so as to complete the sentences meaningfully. Q11. In the aftermath of Partition, seen as the outcome of the community-based template of political competition -------------------------- under British rule, secularism was an article of faith across the ideological spectrum, though only in a limited definition as a ----------------------- sense of national identity. ‘Introduction’ and ‘seamless’ grammatically and contextually complete the sentence. Q12. In the real world of dislocation and trauma, Partition ------------------- a number of local vigilante efforts to ------------------ a narrower identity on the incipient nation. ‘Witnessed’ and ‘inscribe’ grammatically and contextually complete the sentence. ‘Inscribe’ means to write, print, mark, or engrave; ‘Witness’ means to experience. Q13. It is on record that Prime Minister Jawaharlal Nehru wrote ---------------------- to the Chief Minister of Uttar Pradesh at the time, Govind Ballabh Pant, insisting that the idols ---------------------- into the Babri Masjid should be removed. ‘Insistently’ and ‘smuggled’ grammatically and contextually complete the sentence. ‘Insistent’ means earnest or emphatic in dwelling upon, maintaining, or demanding something; ‘smuggle’ means to bring. Q14. If equality was a constitutional promise -------------------- to reconcile with upper caste hegemony, identity was a ---------------------- alternative. ‘Impossible’ and ‘serviceable’ grammatically and contextually complete the sentence. Q15. From its birth in the 1980s, the Ayodhya campaign has ----------------- a metaphor ------------------ a minority faith’s disenfranchisement. ‘Been’ and ‘for’ grammatically and contextually complete the sentence.